Due to a couple of personal circumstances I have decided to leave Haiti a month early before my term ends and head home. I am going to try and keep writing on my blog experiences I have had and ways I have seen God move even as I am at home. There have been so many things I would have loved to have shared but just didn't have time to write. When I begin to look back at this year the big thing that stands out to me is God's faithfulness. This year has been difficult for me, maybe even to be honest the hardest year of my life and it started right from the beginning. 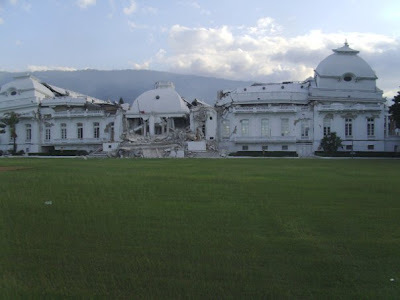 I left home on 9th January to go to Greenwood Indianda and on 12th January I heard news that my granny had died and also Haiti had suffered from a huge earthquake. I wanted to be in either of those places and instead I was in the states. When I think about the situations I have been in this year, if you had have told me before that I would be able to cope with them, I would have said no way I could never do that. Situations like listening to stories and praying with people who lived through the earthquake and lost everything they had including their family, going on trips to Port to work in tent villages, sharing the gospel boldly, working with patients with Cholera to simple things like driving a 15 seater van (with 15 people in it), being brave enough to kill cockroaches and sleeping in the same room as a rat (one of my least enjoyable experiences). YET God was faithful and give me the strength for all these situations and many many more. I like to think I am tough but I am not really, watching the film My Girl or ER makes me cry and this past year I have spent each and every day with people who are suffering, suffering because of the earthquake, because of cholera, because of poverty, because of illness, because of death YET again God had given me the strength to build relationships with these people, to help them physically and spiritually and to help carry some of their burden. Before this year I have never really experienced death in my life and this year I have experienced to much death that I care to even remember........I have even watched a 4 year old child and a 23 year old girl die of cholera right in front of my eyes, YET again God remained faithful and unchanging giving me the strength I needed to cope with those situations. 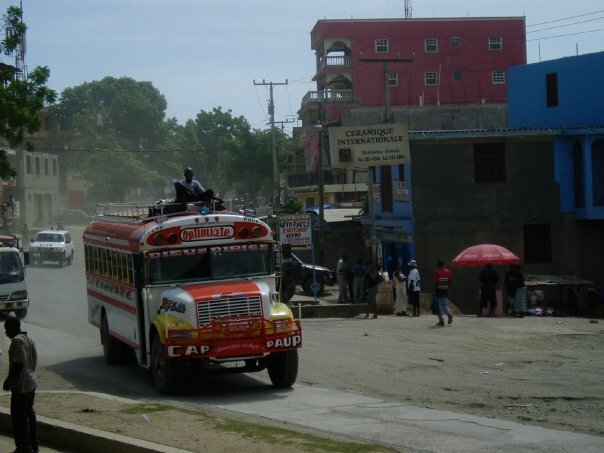 To be honest there are many things about Haiti which I will not miss, the pothole covered roads, wearing skirts, bean sauce, the smell of cholera, flip flops, sweating, the sound of car horns, motorbikes, wheelbarrows, chickens, goats, pigs (basically all those things which are on the road which should not be there!! ), mosquitios and hearing Celine Dion's my heart will go on at full volume!! Saying all that there are many things I will miss, Haiti is so very close to my heart and God has given me a love for the people rather than the actual country. I find it hard to love a place where people are suffering so much everyday but I love the people, I love speaking and listening to Creole and usually if I am not feeling very good walking down the street and someone saying 'Bonswa Cherie' to me usually brings a smile to my face. The thing I will miss the most are my good friends Dr Rodney and Vedane and their beautiful kids. I probably spent time with them everyday, Vedane has become one of my very best friends. I will miss going down to their wee house and Oly greeting me with ' Hello missionary. ', Alisha's huge smile as soon as I walk in the door and Wood jumping on top of me as if he hasn't seen me for months. Dr Rodney is a very special man clearly chosen by God to help his people. He has taught me a lot about Haiti and its culture. He has also made us laugh so many times with his Dr Love consultations!!! Even though the next wee while is going to be difficult I know God will remain faithful as he has been in 2010 and will give me the strength I need for each day. God promises he will never give us more than we can handle and I know that to be true. Here are some of God's promises I have had to depend on over and over again this year. He give power to the faint and to him who has no might increases strength. they shall run and not be weary they shall walk and not be faint. Cast all your anxieties on him because he cares for you. Great is Thy faithfulness, Great is Thy faithfulness, Morning by morning new mercies I see: All I have needed Thy hand hath provided Great is Thy faithfulness, Lord unto me! After being at the clinic for too many hours everyday and night working with our patients who have cholera I hadn't even thought about Christmas. However on Thursday Hannah, Matt, Stacey and I had to go to the Dominican to renew our visas. 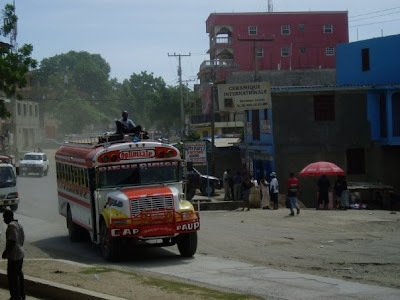 We have to leave Haiti every three months and unfortunately for us the quickest and cheapest place to go is the Dominican Republic. Hannah and I were more than ready to go on Thursday afternoon when Matt and Stacey came to get us as we were both in need of some rest. We got through the border no problems even though Hannah and I had been working with cholera patients just a few hours beforehand. As we were driving through the DR it started to get dark and then I saw the first Christmas tree. After that every time any of us saw one it was like look at that one, look at those decorations....it was like we were kids again and amazed at everything. We had the Christmas music on looking at the Christmas trees, then we arrived at the ridiculously cheap all inclusive hotel. As we pulled up we saw this huge Christmas tree, straight away we had to get out and look and take photos of the tree. of course then as soon as we got back home we put our Christmas tree up in the house. Its so hard to even think about Christmas in Haiti especially with people suffering so much. The other reason is because it is hot and sunny and it really only feels Christmas at dark time when the Christmas lights go on. Back to the hotel, while we were waiting for our rooms to be ready the guy at the desk told us to go and eat. We went into the huge dining room and all 4 of us just wondered around for a while (Im sure we had our mouths open) before we even knew what to do. There was so much food, we didn't know where to start so we started with the drinks. Hannah was the best, she went over to get some coke, it was like the drinks machines you see at Mcdonalds. Hannah filled one glass up, drunk it and continued to do the same thing over and over again....it was hilarious! !Finally we chose something to eat, thing we could not get in Haiti.....Pizza, pickles, fries, cucumber. and strawberry ice cream. Talk about culture shock. On paper the Dominican is a third world country yet I felt like I was in the States. The roads were all paved, all the houses had electricity (with christmas tress!! ), there was road signs, traffic lights, the shop was about the size of Tesco's and you can find everything you need. It was just overwhelming to go from working in our cholera clinic and just that morning seeing a little girl arrive with cholera who was already dead in her dad's arms. To a place where we could eat whatever we wanted, whenever we wanted and lie by the pool, go to the shop and find what we needed or just what we wanted (granny smith apples!!). It actually made me wonder how the human mind copes with that sort of change in just a few hours. I felt so far away from Haiti........yet it was just a 5 hour drive away. One of the things I find hard being in Haiti is being a 'blanc' and all the things that come with that. No matter how long I live in Haiti if I speak Creole perfectly, carry things on my head, hand wash my clothes do everything Haitian I will always stand out just by being white. Being in a resort full of 'blancs' it was so nice not to stand out. Saying that we were the only people wearing jeans and hoodies in the evenings when everyone else was out in their summer dresses!!! The next day it was cloudy and overcast, still crazy british people were out by the pool in their swimming stuff and then us, the missionaries from Haiti feeling cold! !Jeans and hooides again for everyone.We were sitting by the pool with Lily (Matt and Stacey's daughter who is just 22 months), there was a lady beside us reading a book and Lily went over and said 'is that your bible?' It was too cute and she was very dissapointed to find out it wasn't, the lady actually apologised because Lily looked so sad. Maybe we didn't blend in as much as we thought!!! The trip was mainly to renew our visas but we also got a time of rest, we had lots of fun together especially as we dont see Matt, Stacey and Lily much because they live in Sakenvil at the seminary. We were also able to buy lots of supplies for the clinic thanks to a very generous donation to some people from home. There are so many supplies which we need in the clinic which are so difficult to find in Haiti and if we do find them they are very expensive. We were able to buy lots of baby formula, nappies, baby bottles, baby wipes and sheets all of which we desperately needed. We are back to work in our chlolera clinic which still has a steady flow of patients. In the past 2 weeks we have treated over 60 patients and all of them have got better and been sent home. Thankfully this week we hae two doctors and two nurses here on a team which is great. We are thankful for the rest, for the supplies we were able to get for the clinic and that we had no problems getting there or coming back. If you drink lots of alcohol you will be protected against cholera. You can buy a medicine in the street which will protect you against cholera. Which all of course are not true. This week Bethesda began to treat cholera patients. At first we had put them in a tent outside which was fine for one day but not good enough. One of our other missionaries Jane had the idea of using one of the old houses which is just beside the clinic. When we went to look at it, it was perfect for exactly what we needed. On Wednesday we arranged the house and brought over all the supplies we need. Thankfully we were able to get more IV fluid in town, this is the main treatment for cholera and last week we we unable to buy any in Cap Haitian. Since Wednesday we have had a steady flow of patients, mostly children from a number of different areas, and mostly brothers and sisters. We have had a few difficult cases where they have been so dehydrated it has been really difficult to find a vein to put the IV fluids in. One little boy I would like you to pray for especially, he came on thursday morning severely dehydrated and it took our nurses over an hour to find a vein to place an IV. He was given fluids all day and all night and seemed much better on Friday afternoon he was also drinking alot. However he continued to have diarrhoea through the night on Friday and by saturday morning he was severely dehydrated again, as our staff worked on him they couldn't find a vein as he was so dehydrated. We continued to give him fluids by mouth as we were able. Dr Rodney then had an idea of IV into the bone which I have never heard of before but he did it (it was his first time ever...he had just read about it!!). Thankfully we had the equipment and with alot of praying going on at the same time Dr Rodney got it in and the IV started. Since then it has been running, we have been giving him oral fluids aswell all through the night however he is still having continuous diarrhoea and is losing alot of fluid. Please pray today we will be able to find a vein, give me another IV which is so desperately needs so we give him more fluids than he is losing. Its scary how quickly cholera can dehydrate someone, especially kids. The continuous vomitting and diarrhoea removes all their fluid very quickly. If someone gets cholera time is really the important thing. Friday we had a young girl come in who just started getting sick that night around midnight and by 8 am the next day she was very very unwell. Dr Rodney started two IVs and within 20 mins she was awake and talking. Her mum was crying as her big brother was in the clinic aswell, as soon as she woke up she said 'mummy don't cry for me just pray to God for me,' It was very cute and today she is a million times better eating and drinking. Thankfully all our other patients are responding well to treatment. My role in the clinic had definitely changed from just a physiotherapist! !Please pray for us as we treat patients, for continuous supplies, for strength for our staff especially Hannah, Dr Rodney and I (please!!) who have been in the clinic long hours and though the night. This week Bethesda is starting two special weeks of 'Combat Cholera'. Each day the patients will be educated on how they can protect themselves against cholera. Each patient will be given soap, A bottle of chlorox (bleach) and oral rehydration powder. We also have a fixed price of 250 goudes (about $5 US) for each consultation and any medicine which patients need. We expect to have alot of patients and on top of treating cholera patients its going to be hard work! !However we will be able to educate alot of people and give them materials on how they can protect themselves and their families agaisnt cholera. Plus we have a medical team arriving next Saturday from the states which will be great. **I wrote this yesterday and didn't have chance o post it. Today we have even more patients and our 'hospital' is nearly full. Please continue to lift us up in prayer , also among the business we will have time to share the gospel with our patients. Just as I think life in Haiti cannot get any worse, it does. When I think the people cannot cope with anything else they find the strength to. 12th January brought the earthquake in Port au Prince, November brought Hurricane Tomas which caused mass flooding and now cholera.....on top of life as it was in Haiti and all in the same year. As you have probably heard on the news Cholera is spreading fast in Haiti. After beginning in the central plateau in Haiti, cholera has now spread to all 10 regions in Haiti. Everyday we are hearing of more people dying from Cholera here in Cap Haitian. They have opened the local gymnasium in the centre of town to recieve patients and Milot hospital has received over 50 patients just over the weekend. Bethesda and OMS as a mission is trying to provide as much education as possible to the community. It is very easy to protect yourself against cholera and education will be the thing that will stop it from spreading further. So far we have had education sessions with over 1500 kids, our seminary students, the local church in Sakenvil and with our pastors. We are encouraging everyone who hears the information to pass it onto people in their own local community. The pastors and studnets have taken the information back to their churches. Dr Rodney has also made an announcement for Radio 4VEH which has up to 1 million listeners each day. One area which has been badly affected in an area called Souffriere. Souffriere is where we have a done a few mobile clinics before. Souffriere is a very poor area, the only water they have is from the local river and there is no place to use the bathroom. Now the river is infected with cholera yet the people have no where else to find water. Its easy to give advice but if people have no means to follow the advice they don't have any other chocie, they have over 30 people who have died in that area. Yesterday Dr Rodney talked in the clinic about the numbers or people who are sick, the numbers of people who have died, to be honest it is probably alot higher than what has been reported. He explained how the situation in Haiti makes it easy for cholera to spread. The piles of rubbish by the side of the road breeding bateria, no clean water, people having no toilets to use, people not washing their hands....all these things contribute to cholera spreading here. His conclusion was the ONLY thing which can stop this is the prayers of God's people. Humanly speaking its going to be impossible, however we serve a God who can do the impossible and we trust in him to change Haiti. I will be honest sometimes it is so hard to see how this country will ever change. We hear news about the extent of cholera in Haiti, also yesterday and today there are demonstrations and violence against the UN in Cap Haitian because of Cholera, people are scared, people are tired of suffering and they want something done about it. On top of that the election for a new president will take place in two weeks time (28th November). So far no-one I have spoken to is going to vote...not one single person because 'there is no one worth voting for.' Things are always a bit unstable around election periods with some people rioting, saying that we will not be going anywhere near town over the next few days!! I am sorry to sound so dismal but this is life in Haiti right now. God is the only person who can ever change this country. Please keep praying for this nation.....its needs miracle upon miracle to change it. On Thursday morning the 14th October, three missionaries, four member of staff at the seminarary and eight of the students took the 8 hours journey down to Port au Prince. Thankfully they have been working on the road and the last four hours of the journey was all on smooth (mostly) paved roads. Coming into Port I sort of expected things to be different. 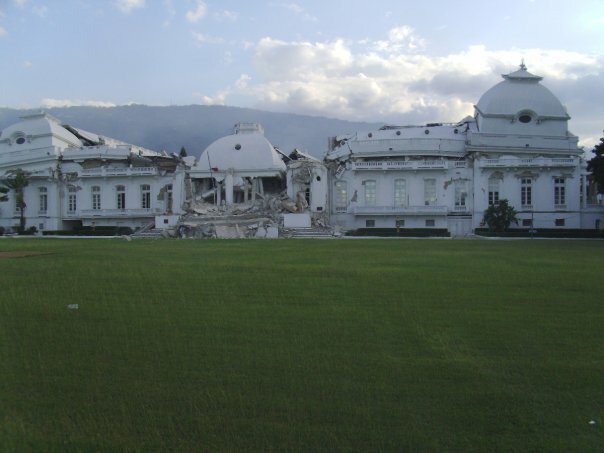 It has been 10 months since the earthquake yet to be honest I did not see alot of change. There is a bit less rubble by the side of the road, a few buildings have been rebuilt and a few new houses have been built however in general there are still thousands upon thousand of people homeless and sleeping outside in tents, in makeshift homes which are made of a tarp yet have a tin door with a wee padlock. We drove right up to the top of the hill and arrived in Diquini to be greeted by Junior (our seminary studnet who has lived there for six months to lead the church) and several members of the church, one of the teenagers came over hugged me and said 'hi Julie'which amazed me, its been six months since I had been in Diquini. That evening we started with a service I think there were around 100 people there with a lot of people sitting outside the actual church 'building'. Matt preached the gospel clearly and simply and 12 people came forward at the end of the service to give their lives to God. Over the next two days we spent the morning in the local community praying with people and sharing the gospel with other people who didn't yet know. I was out with one of the pastor's and it always amazes me how open haitian's are to talking about God. Like we just arrive at their house and everyone is sitting outside anyway and ask can we come and have a chat and they are like yes sure. We didn't have one person who didn't want to talk to us. One young guy we talked to was sitting with his friends and they were all very 'cool', long hair, ears pierced etc. We shared the gospel with the group and asked them what they thought, the young guy said he knew God was there after he saw what God did for him because he wasn't hurt in the earthquake. However I went on to explain its good to say thank you to God for those things, but what is even more important is that we are sinful and God did something even greater he sent Jesus to die for our sins and now we can have forgiveness and a relationship with him. The guy said he wanted to be saved but he had to wait until he was a better person, until he cut his hair and took out his earrings and until he had some 'nice' clothes for church. It was great to be able to tell him he can come to God just the way he is, he doesn't need to change first that it is God who will do the changing within him. Right there in front of his 'cool' friends he got down on his knees and prayed. He asked God to forgive him of his sins and said he wanted to Serve God with his life. Later we went to the house of a lady called Marie. She had just become a christian recently and asked us to come into the house to pray with her, while we were there one of the pastors asked if she had anything in the house which she wanted to get rid off. He asked this because she was very involved in Voodoo before she became a christian. She went into the corner of the room and pulled out a bag of something, she explained she had been sick and had gone to a witch doctor for 'medicine' to help get her better. She didn't want anything to do with Satan anymore and therefore didn't want it in the house anymore, we agreed to take it and burn it. Then we prayer for her and over her house...a place and a life which has belonged to Satan had now been changed to a life for God. That night she got up in the service and explained to the church how God had changed her life. The other thing which Junior has been doing with help of some people from the states is building houses for some of the families. I can't exactley remember but I think they have built 12 houses. He bought the materials and the people built them themselves. Marie has one and they really are nice, they are made of blocks and cement and have an nice tin roof. We also ran a kids club on friday and saturday where we had singing, a memory verse, a story from the bible and some games. It was really great and the kids remembered the song we taught them in English from the time when we were there in April. Word got out on the second day and we had over double the amount of kids. Even though we had a great trip with many lives changed for God and the church encouraged, the situation is still desperate. There are so many people sleeping in tents still and from what I saw of the city it doesn't look much different to how it did in April when I was there. Every night we were there it rained and when it rains in Haiti it really rains heavy. The Saturday night there was a huge thunder and lightening storm, it was the loudest and longest thunder I have ever heard in my life. I was staying inside a building on a bed dry and safe and I was still scared. All I could think of was the thousands of people who were sleeping outside under the cover of a tarp or a tent....I can't imagine it would provide much protection from a storm like that. The thunder and lightening lasted for a good hour and it rained most of the night. When we got up the next day we heard that one of the families 'homes' on the hill had blown down in the storm. Please continue to pray for the people in Port, pray for Organisations who are building homes for people, pray for the government which actually will be changing this month as it is election month and pray that the money which has been pledged from so many other places will be sent and used wisely to help the people of this country.